Durable, heavy-duty vinyl pocket keeps documents safe. Gusseted pocket expands to hold papers, catalogs, booklets, magazines, etc. Flap keeps documents secure. Letter size. Clear. Holds up to 200 sheets. Fits standard 3-ring binders . 10/PK. 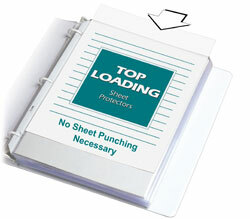 Sheet Protector Special Features: Vinyl, top loading sheet protector with gusset has a tuck-in flap and can fit up to 200 sheets. Suggested Use: Gusseted pocket expands to hold papers, catalogs, booklets, magazines, etc.